The carved enrichment, from top to bottom, consists of a fillet, cyma recta with incised honeysuckle palmettes and wavy line between, another fillet, a shallow-cut dentil course, and then finally a plain cyma recta moulding below. The wide spacing of the plain palmettes and the half-cutout dentils indicates a dating at the end of the Roman Republic and the beginning of the Empire. 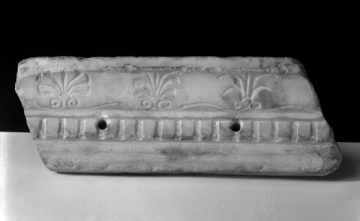 The design develops from a characteristic Hellenistic pattern, but the rather second-rate, slip-shod workmanship here suggests derivation from a private structure such as a tomb monument. The two prominent drilled holes relate to the original installation of the piece at the Museum and would have been made to enable fixing wires to be passed through this very heavy piece to enable it to be hung on a wall. Rome; collected in Rome by Charles Heathcote Tatham for the architect Henry Holland during the 1790s. See Cornelius Vermeule, unpublished catalogue of the Antiquities at Sir John Soane's Museum, Introduction, transcription of Tatham letters, List 1, no. 23.